We have a lot of fun with these appetizers made from olives, ranch-flavored cream cheese and carrots. They’re always a hit at parties! Some people think they’re too cute to eat but we think they are delicious. Originally from AllRecipes.com. The cream cheese mixture in the recipe below is enough to fill 50 colossal olives, so if you’re making a smaller batch, you’ll have some cheese left over. We like to put the extra into celery sticks, for people who don’t like olives. Get the bodies ready for filling. Select a jumbo olive and slice a little bit off the hole end so it sits nicely. Cut a slit from top to bottom, lengthwise, into the side of each jumbo olive. Or, if you want a big white area for the belly, cut a narrow wedge out of the olive from top to bottom (this is what I do). Form all of the feet you’ll need. Slice the thick end of a carrot into 3 mm thick rounds; cut a small notch out of each carrot slice (example below). You may need several carrots, depending on how many feet you can get out of the end before it gets too small (10-15 per carrot?). 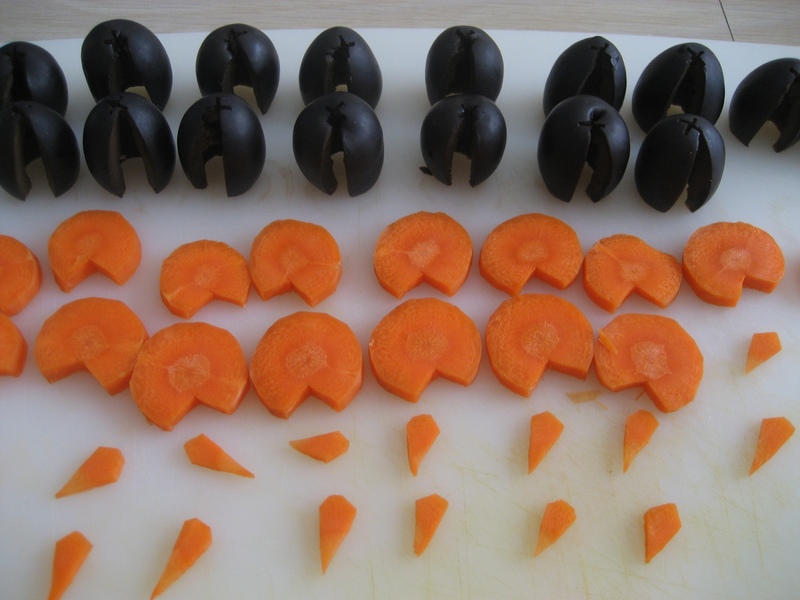 Form beaks by slicing 1-2 mm carrot rounds and cutting them into eight wedges. To make the beaks easier to insert, nip off each corner of the wide end (see example below). Make all of the heads. Select a small olive and trim the hole end to make it sit straight, if necessary. Cut a somewhat downward slit in the middle of the olive, then insert a beak. Fill each olive with about a teaspoon of cream cheese, smoothing the front flat with your finger and also wiping away any on the outside with your fingers. Make sure it’s full enough to expand a little to make a nice belly. Wipe any excess off your fingers on the edge of a bowl or with a spatula, then wipe fingers clean on a towel. Assemble. Set a big olive, large hole side down, onto a set of feet. Then, set the head, hole side down, onto the big olive, adjusting so that the beak, cream cheese chest and notch in the feet line up. Secure with a toothpick. Use frilly toothpicks for a more festive look. 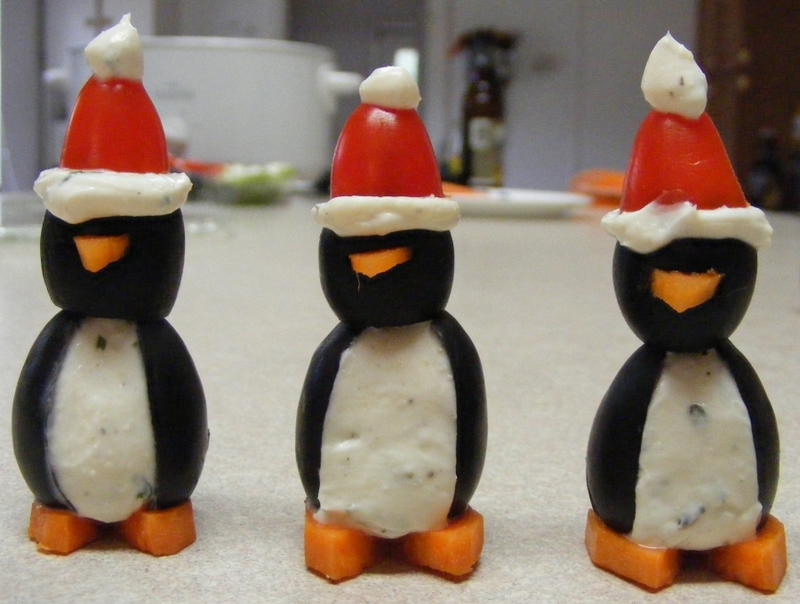 If you need to take your penguins to the party, there are a couple ways to get them there safely. We usually use empty egg cartons to store and transport the penguins. They stay mostly standing up and you don’t have to worry too much about them getting jostled around or falling down. Another way is to put them in muffin tins. You can fit two or three per cup, cover with aluminum foil, and away you go! With this method, you could also put ice in another tin and put it underneath, to keep them cold.